You are here: Home Health Tips Dr Dillner’s health dilemmas: should I sleep-train my baby? Comments Off on Dr Dillner’s health dilemmas: should I sleep-train my baby? Dr Dillner’s health dilemmas: should I sleep-train my baby? It’s one of the most controversial subjects for parents, but can a regular routine help your baby learn to get to sleep? Nothing (except perhaps breastfeeding) gets parents more worked up than whether or not you should sleep-train your baby. Babies are not programmed to sleep through the night until they are at least six months old. A study in the BMJ showed that mothers of babies who didn’t sleep had increased rates of postnatal depression. Other studies suggest babies who don’t sleep may develop more slowly. There are various techniques, not supported by much research, that involve setting regular routines and then either leaving your baby to get to sleep on its own or sleeping alongside it. The dilemma: You don’t want to harm your baby, but you’re desperate for a few hours’ sleep and what if your baby just can’t learn to sleep without help? Is there a nice way to do it? The technique often accused of being brutal is the “cry it out” approach â€“ invented by Dr Emmett Holt in 1895, which involves letting your baby cry for a defined amount of time before comforting them. The method was softened by Dr Richard Ferber, an American paediatrician who suggested a bedtime routine with cuddles, followed by putting your baby in its cot (or your bed) while he or she is still awake and letting them learn to fall asleep. You leave the room and if they cry you wait, pat them on the back and say, “go to sleep”. Each night you wait longer before going in. Doctors advise against doing this before four months because of the risk that babies may be hungry, sick or uncomfortable. Supporters say it is cruel for your baby not to be taught how to go to sleep. 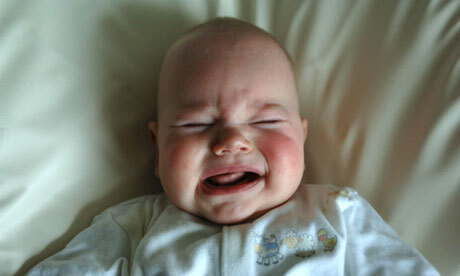 Others argue that you shouldn’t leave your baby to cry. Few people would argue with a routine of bath and books in bed, but after that techniques vary from rocking, singing, breastfeeding, using a dummy, cuddling them or even a short drive. Research in the Journal of Family Psychology, which videoed both parent interactions and babies sleeping (in 35 families), found that the more responsive parents were with their babies before bedtime, the more they responded to emotional cues and the closer the physical contact they had with them, the better their babies slept. And a study from UCLA says that babies get so distressed by being left that they release stress hormones that change the neural connections in a baby’s brain. The solution: It’s up to you â€“ you’re the parent. I wouldn’t leave a baby crying for longer than a couple of minutes (they can throw up when they cry, and it makes me nervous when you can’t see them) and I would rather soothe my baby or put it in my bed. That’s not for everyone. Agree on tactics with your partner, and stick to your routine â€“ but read the research first. No one can be sure that sleep training is risk-neutral.